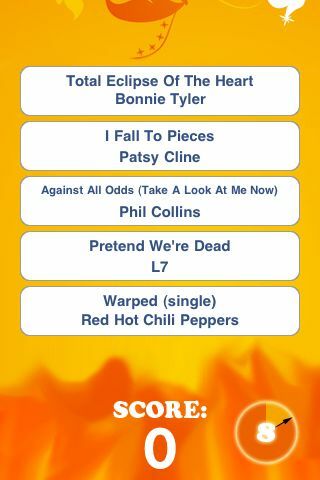 The premise is simple, a song is played and you are given a number of choices for song title and artist. You start with five choices and every couple seconds, an incorrect response is removed. Make your choice with a simple touch. The faster you answer, the more points you are awarded. The game ends with an incorrect choice or if you fail to answer in time. The directions are pretty scant, so it took a little playing around with the app to figure out exactly what was going on. After the loading screen you are shown a “Home Screen”. Press the “Play” button in the center to start the game. To access the minimal directions, press the “i” button on the lower right. The game stores the highest score you’ve achieved. But there are no other leaderboards or achievements. From the Home Screen, you can use the app as a pseudo iPod. If you tap on the current song playing, it will automatically shuffle to a new random song, however, there are no other music controls. There is also no way to pause a game in progress in case you get interrupted. Also, there is an Easter egg to discover. From the Home Screen, keep pressing on your high score and eventually the screen will go black. 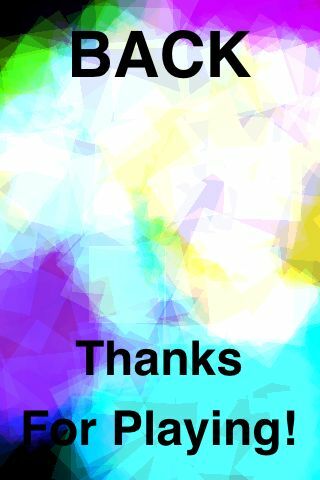 If you touch the screen, color effects splash across the screen. This is more of a gimmick than anything. If it was a simple visualizer that reacted to your music, it would be fun, but it doesn’t. Touch “Back” to return to the Home Screen. 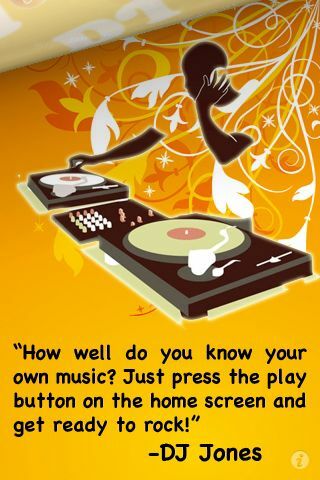 DJ Jones is a pretty fun, but simple app that tests you on your familiarity with your music library. The interface is simple and the directions minimalist. Currently, DJ Jones cots $2.99 and weighs in at 3 MB. Tip: Use your headphones for ultimate enjoyment, the external iPhone speakers are really not that awesome. DJ Jones on the App Store. Entries (RSS) | Comments (RSS) | 90 queries in 0.760 seconds.